With our smartphone screens now aglow with 2015, and the results of Black Friday and Christmas Holiday sales being flaunted in the press, maybe, just maybe, it is time to take a hard look at price discounting as the default tactic to engage consumers. Discounts and price promotions do have their place in the marketing mix, especially if executed in a focused manner in association with other customer engagement tactics. But overall, to what end should discounting be used? For retailers operating a loyalty program whose value proposition is anchored mostly in discounts and rebates, the risk of engendering loyalty to the program and not to the brand is high. The objective, therefore, is to look at alternative methods that build customer loyalty to the brand and maximize customer value, in order to reduce the need to rely on the discounting lever. 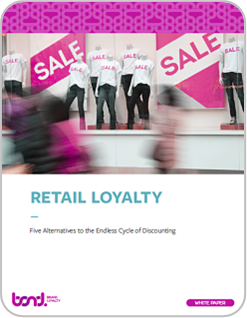 Download the white paper to learn more about the complicated nature of discounting and how to build sustainably differentiating tactics and strategies to enrich the bottom line and achieve long-term brand loyalty.